Here is one of the best resources on elderly endurance training exercises for seniors on the internet! As we age, our endurance level begins to decline. Many of us may find it difficult to keep up stamina even for performing simple day-to-day activities such as walking up stairs, going grocery shopping and performing household chores. Although, this is just part of getting older, but there’s a lot we can do to maintain or even increase our stamina while we grow old. 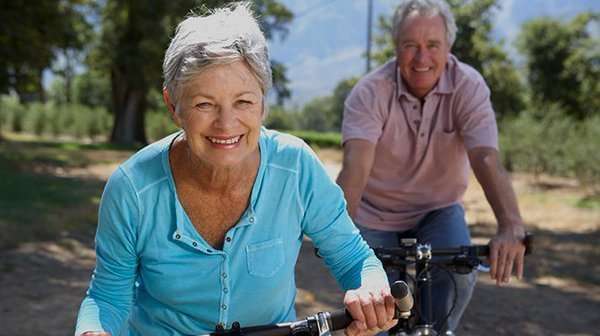 Many studies have shown that exercises can improve stamina and endurance for older adults , as well as reduce their depressive symptoms, enhance mobility and cut down risk of heart disease and diabetes. And, with increased endurance the seniors can perform daily tasks on their own and so physically they won’t be dependent on others. In this article, you will learn what is endurance workout, its benefits, examples of exercises for older adults to improve their endurance and how much and how often they should do? Endurance exercises include any activity that increases your heart rate and breathing for an extended period of time. Examples are walking, jogging, swimming, raking, sweeping, dancing, and playing tennis. (i) to walk farther, faster, or uphill. (ii) to carry on everyday activities such as gardening, shopping, or playing a sport. In nutshell, the endurance exercises increase endurance, energy level, improve fat metabolism, and prevent heart diseases. Endeavour to build up your endurance gradually. If you haven’t been active for a long time, start out with as little as 5 minutes of endurance activities at a time and work your way up over time. It may take months to go from a very long-standing sedentary lifestyle to doing some of the activities suggested above. Your should strive to work your way up in due course to a moderate-to-vigorous level that increases your breathing and heart rate. It should feel somewhat hard to you. Once you reach your goal, you may divide your exercise routine into sessions of moderate-intensity endurance activities for no less than 10 minutes at a time (if you want to), as long as they add up to a total of a minimum of 30 minutes at the end of the day. Doing less than 10 minutes at a time won’t give you the desired heart and lung benefits (Exception to this rule is when you are just beginning to do endurance activities). (i) Do a little light activity before and after your endurance activities to warm up and cool down. For example, slow walking before and after brisk walking. (ii) Make sure that endurance activities should not make you breathe so hard that you can’t talk. Moreover, they should not lead to dizziness, or chest pain or pressure, or a feeling like that of heartburn. (iii) Stretch after your endurance activities when your muscles are still warm. (iv) As you grow older, your body may become less likely to set off the urge to drink when you need water. That means you may need water, but you won’t feel thirsty. Make sure to drink liquids when you are doing any activity that makes you sweat. In fact by the time you feel you are thirsty; you are already dehydrated to some degree (low on fluid). This thumb-rule holds true through out the year, but is particularly more so in hot weather when dehydration is more likely to occur. Note: If your doctor has advised you to control your fluid intake, make sure to consult him or her before increasing the amount of fluid you drink while exercising. (v) Dress appropriately for the heat and cold. This guideline is especially applicable to older adults. They are affected by heat and cold more than other young adults. In utmost cases, exposure to too much heat can lead to heat stroke, and exposure to very cold temperatures can result into hypothermia (a dangerous drop in body temperature). Tip: If you are exercising outdoors, dress in layers so you can add or remove clothes as necessary. (vi) To prevent injuries, use safety equipment such as helmets for biking and protective equipment for activities like skiing and skating. (vii) If you walk or jog, wear proper shoes, made specifically for that purpose. (viii) When you’re out for brisk walking or jogging, watch out for low-hanging branches and uneven sidewalks. Try to build up to do at least 30 minutes of endurance exercise on most or all days of the week. More often is better, and if you can do it every day is best. Going further, try to build up the amount of time you spend doing endurance activities first, then build up the difficulty of your activities. For example walking longer distances, and then walking more briskly or up steeper hills. Are you an older adult? What exercises you do, please share with us.